These yummo microwave tuna cakes are soft on the inside and crunchy on the outside, perfect for the little kids (and the big ones) in your family. Cook potatoes with 45 ml (3 tbsp) water, covered on HIGH power for 6-8 mins. or until cooked. Drain. Place butter and onion in a bowl, cover and cook on HIGH power for 4 mins. or until soft. 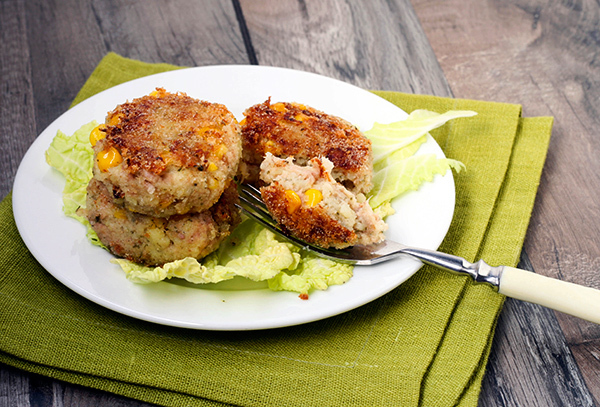 Stir in tuna, corn, hard-boiled egg, parsley and lemon juice, season well. Shape into 8 cakes and coat in beaten egg and Breadcrumbs. Place on grill rack and cook on Combination: GRILL 1 and SIMMER power for 16-18 mins. or until brown, turning halfway. Check out our Steam Combi microwave: http://www.panasonic.com/au/consumer/household/microwave-ovens/nn-cs894s.html.